Looking for the Best Decaffeinated Coffee? Here are our top picks with reviews for all coffee formats (whole bean, ground, K cups and instant) and useful information to help you purchase the perfect tasting decaf that meet your needs. Lately, people pay more attention to their health and what they bring into their body through food and drink. This also brought some changes in coffee culture. People who are sensitive to the great amount of caffeine required a substitute for coffee that doesn’t have a bad effect on their body. Coffee has caffeine which is a substance that has effects on the Central Nervous System of Humans. When people consume caffeine, they are stimulating the normal function of their Central Nervous System (CNS) which may cause restlessness, heart arrhythmia, insomnia or digestive problems. It is important to know that decaf has a small amount of caffeine. Using different methods manufacturers can remove 97 % of the caffeine from coffee bean before roasting but there is still a small amount left. Some scientists say that if you drink 10 cups of decaf coffees you put the same amount of caffeine as two cups of regular coffee. The 6 oz cup of decaf coffee can contain from 0 – 7 mg of caffeine. Only people sensitive to caffeine should switch to decaf coffee, it is well known that coffee also has a good influence on the body because it has a lot of antioxidants and small amounts of several nutrients. It’s hard to choose a great decaf coffee that will replace regular coffee. 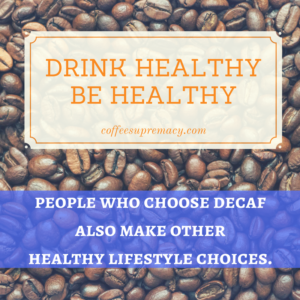 Often people who go to healthier choices have a problem finding a decaf coffee that will have the same good taste as regular coffee. We hope that our suggestions help you to find the right decaf for you that will satisfy you with taste, smell, aroma, after taste, price and other features like organic, fair trade, Swish water process, Arabica %100…. According to the demand, manufacturers have made efforts to offer decaf coffee in various variants. Now you can find decaf whole bean, decaf ground coffee, decaf pods, decaf capsules etc. Best known are those produced by Café don Pablo, Peet’s Coffee, Kicking Horse,Volcanica Coffee, Illy Espresso and many others. Below are some of the best decaf coffee that consumers should make sure to choose if they are sensitive to caffeine. 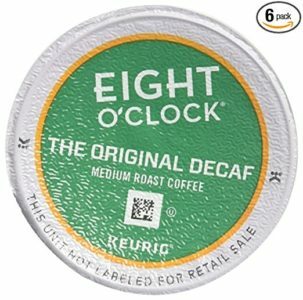 6.2 Are decaf coffee really caffeine free? It would be misleading to say that decaf coffee beans does contain zero caffeine in them. Nevertheless, the caffeine content that they have differs from brand to brand. Coffee beans do have a certain favorable level of caffeine in them, and that amount is considered good for the human well-being. In this sections, there is going to be an deep exploration of various types of decaf coffee beans regarding quality and taste. There is a lot of false advertising and many big words that ultimately are a lie. When someone (Cafe don Pablo) for their decaffeinated coffee says “Tastes like the real thing without the caffeine!” it is not easy to trust. We drank many decaf coffee and rarely any of them had a tastes like coffee. We won’t know is it lie or the truth until we try it – this is our thought because we do not want to accuse someone of lying just because we can hardly believe in that words. Made from Colombian Supremo Beans, Café don Pablo is made to kill with its amazing taste that brings an amazing form of satisfaction to the consumers. 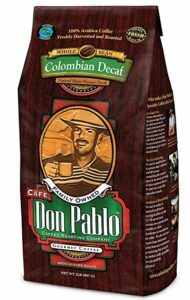 Alongside being made with high-quality Colombian Supremo, Café don Pablo is decaffeinated and they use 100% Arabica coffee beans. It is, therefore, a product that is meant to serve the purpose of giving satisfaction while taking care of the health stability of the consumers. This amazing product has some note of cocoa and caramel alongside and little aroma of citrus. Note: this is not flavored coffee. During any time of the day, Café don Pablo can be consumed as it does not have any form of caffeine negative effect on you. At least all coffee lovers know how undulating it can be to come across dark roasted coffee in the contemporary market. Kicking Horse Coffee Decaf is one of a kind and is meant for people who know the secret behind dark roasted coffee. It has original deep and rich taste that would not let you put that cup down once you have started sipping from it. 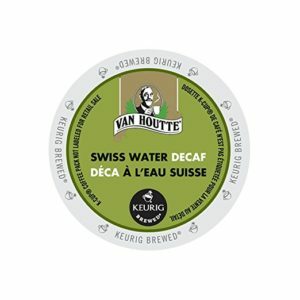 Besides being dark roasted, Kicking Horse decaf coffee beans is made through the Swiss Water Process to augment its fancy taste so that it is both unique and fascinating. The Central and South America are the primary sources of the beans used to make this coffee variety. 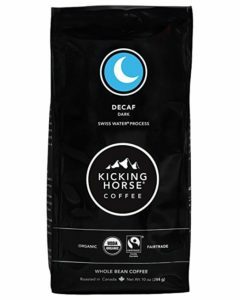 Kicking Horse Coffee Decaf is Amazon’s Choice for “decaf coffee beans”. Kicking horse is on other our best list. That list is the best dark roast coffee beans and ground coffee. In Black Horse company know what is good coffee. One of the best decaf coffee I’ve found. Perfect dark roast for espresso. This is the coffee that is meant for those people who are in love with a smooth round taste that feels bold on the tongue. It originates from Arabica Coffee and is available in almost all coffee outlets in all parts of the world. 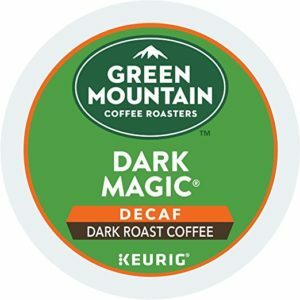 In case you are looking for something that is both delicious and free from GMO, USDA Certified Organic Coffee, then this is the decaf coffee for you. It does not have almost any caffeine in it as the manufacturers do recognize the adverse effects of caffeine on the CNS. 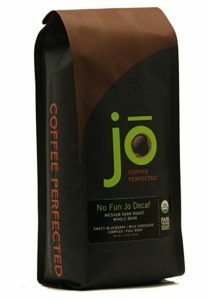 With the help of Swiss water process, Non-Fun Jo Coffee is very quality decaf coffee and great choice for organic whole bean decaf coffee. Excellent for cold brew. No Fun Jo exceed my expectations. Finally a good cup of decaf coffee. Organic, whole bean, decaf, wonderful flavor all what I need. Decaf Coffee brands can at times get expensive and not easily accessible. However, Eight O’clock Coffee is readily available, affordable and is of high quality. Check other best high quality cheap coffee beans. On that list is of course and Eight O’clock whole bean coffee (regular). A medium roast is enough to provide it with the flavour that is required by the coffee lovers. 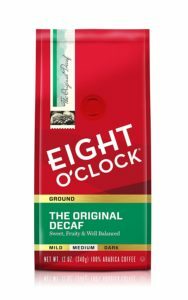 Eight O’clock is made of 100% Arabica coffee that is smooth and readily blends as compared to the Robusta coffee. This coffee is not bitter at all and can, therefore, be taken at any time of the day regardless of the weather and moods. Its low level of caffeine is ensured by the Swiss Water Process that is carefully done to retain originality. This type of decaffeinated coffee is good for those with sensitive stomach. 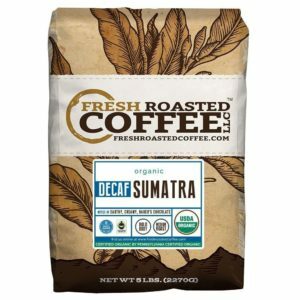 However, Decaf Sumatra is for everyone who love or must to drink decaf coffee. Unlike the rest which is Swiss Water Processed, Fresh Roasted Coffee Sumatra Decaf is mountain processed. It is therefore of high quality as compared to the some decaf whole bean coffee. After going through processing, it comes in whole bean form that looks appealing and satisfying to the eye. Its sumptuous look does not stop there, but it is again defined by its amazing taste. During the processing of the coffee, lots of care is taken to ensure that the environment is not adversely affected amid the process. Primarily, this variety is specified to the people who are always interested in enjoying coffee from different origins. This is an amazing variety of Decaf coffee as it has almost 99.9% caffeine level removed. To that client interested in consuming pure coffee, Volcanica is the way to go. It is made through Swiss Water Processing, 100% chemical free and the steps taken are thoroughly engaged to ensure that the end product is the right quality as defined by the market demand. Its medium roasting does a perfect job in exuding the best taste without any shreds of bitterness in the taste of the coffee. From the Mountains of San Jose, Volcanica is an authentic ambassador of what a great taste from this region is supposed to be. Many coffee varieties are available, but most of them do not match the standards of Sunday Drive Decaf. 100% Arabica coffee beans, medium roasted, full flavor and it is natural decaf. This is always done to help those coffee lovers to have a taste of processed coffee that has its natural everything except caffeine. To escalate the taste of the coffee, the Swiss Water process is utilized by the manufacturers. Many people who have been disappointed by other coffee varieties normally prefer this coffee for it does not have chemical modifications packed into it. 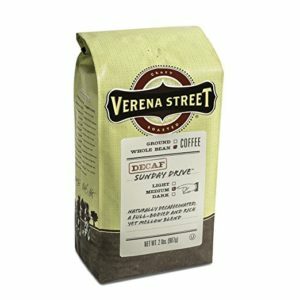 Great whole bean decaf coffee at a great price. Most delicious decaf coffees I ever had. Nice mild taste. Good quality for a reasonable price. 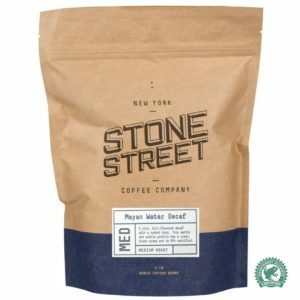 Stone streets do not only make decaf coffee; they make decaf coffee of the highest quality possible. It is an ideal variety for someone looking to enjoy smooth beans which are sustainable. You need to make sure that you give a try to the Stone street coffee Mayan Decaf and the coffee love will get doubled. It does not have any chemicals in it due to the intense Swiss Water process that it is put through. 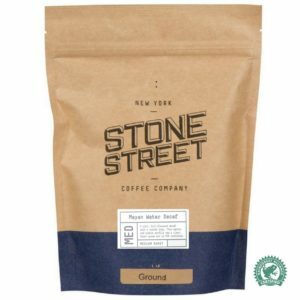 To that client looking to enjoy coffee that has the lowest chemical levels, Stone Street is the way to go. Acidity is kept on the lowest level while the flavour is maintained at an amazing level which makes it the best choice for the coffee lovers who are looking to have fantastic beverage relationship. 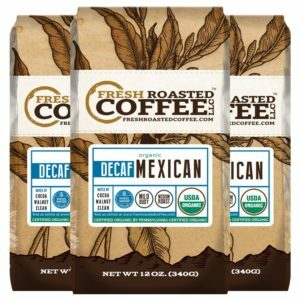 If you are looking for low acid decaf coffee than Mayan Decaf is right for you. As well as regular coffee, the condition in which you are buying it is mostly determined by the fact whether you have all the required equipment to prepare a good coffee and whether you have time to grind coffee. Here are some of the best decaf ground coffee which are chemical free and are ideal for human consumption. Major Dickason’s Blend is the best company’s blend in our opinion. 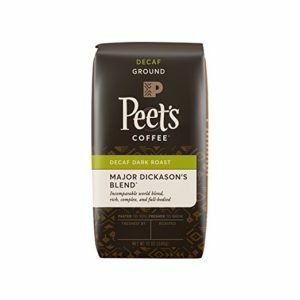 We love Peet’s Decaf House Blend too, but Dickason’s Blend is our favorite. It is common that customers, when they place an order, will get one the most delicious decaf coffee of all time. We prefer whole bean coffee, but sometimes we also use the already ground coffee. 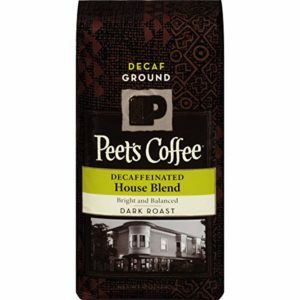 When we talk about decaffeinated ground coffee by us without much doubt Peet’s Coffee are the best. By combining coffee from the best regions where coffee is grown in different World parts, this company has the quality which meets our strict criteria. It has a smooth taste that makes it unique as compared to other brands in the market that do not have a smooth texture. Peet’s Coffee is natural and does not have any traces of chemicals introduced into it. Decaf can taste great, too! I would highly recommend it. The Peet’s does an amazing job in providing the product with great complexity than any other available decaf coffee in the industry. From the Latin America origins, this brand is made using carefully chosen beans in order to come up with the high-quality coffee. This product is deep roasted with hands to achieve the best aroma and quality and is supplied in all parts of the market. At an affordable price, the coffee lovers can have this brand as it has the best flavour balance and is much welcoming as compared to other brands. Bold, flavorful, almost don’t miss the caffeine. This coffee is always processed right from the source till it gets to the manufacturing plant for the final touches. With a careful consideration of texture and quality, this coffee is always processed with so much love. Mexicans Decaf ground coffee is always delivered when it has enough quality to meet the exact client expectations. The way in which this coffee is stored encourages constant freshness and readiness to enjoy as it does have a natural taste without any additional flavours. Mexican SWP is 100% Arabica beans, and it just has the earthly taste since that is what most customers are always looking for. Maybe there are better coffees but they can not beat the Eight O’clock price. This is amazing as it is 100% coffee with no single nut inside of it. Why nuts? We do not know the whole story. 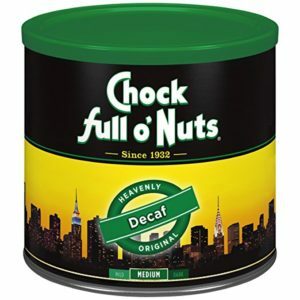 For an extended period, Chock full o’nuts has been New York’s favourite coffee. It is made of the freshest and flavoured beans that the company can buy. And maybe the best of all is that this coffee has an extremely inexpensive price. The coffee beans after the acquisition are slowly roasted just like the company used to do when it was still in Brooklyn. The entire process lasts into a coffee that exudes the best and bold taste that the clients have never put their lips to. This is the decaf coffee that has fuelled New York for ages and is, therefore, a good start to a perfect day. Folgers is grown and nurtured on top of the mountain since that is where it does best regarding quality. Being medium blend, Folgers have one of the best tastes among decaf coffees. 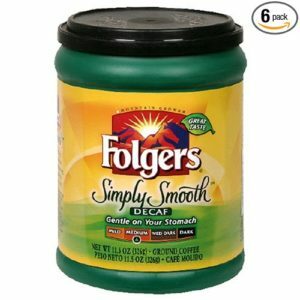 If you looking low acid decaf Folgers Simply smooth is very good choice. It is roasted specially to be pleasant to the sensitive stomach while maintaining rich flavour. It does not have caffeine hence, is vital for the body and can be taken up to the desired amounts. Caribou blend is made up of balanced sweet, spicy and berry nuts and bittersweet cocoa and cedar finish. Being that it is made from the Indonesian Beans, Cocoa Blender has the great taste and texture than other decaf coffees do not have. Also this coffee have taste like real coffee only without caffeine. Caribou Coffee blend is made of natural flavours and does not contain any chemicals that could lead to health complications among the coffee lovers. 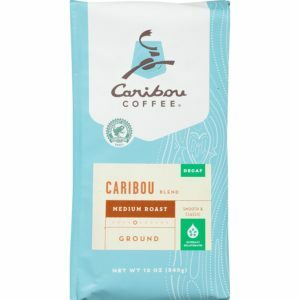 One amazing thing with Caribou coffee is that it is 100% rainforest alliance certified coffee. After you try this coffee maybe you never return to regular coffee. Since Tim Horton began its official operation in 1964, its product has always been served in only one way; fresh. The blend is made of 100% Arabica beans; just like the name hints. Good aroma is one of the first associations on this coffee. The beans are collected from different parts of the world where Arabica coffee is grown. Another great thing about the Tim Horton is that the coffee is always served just 20 min after the brewing. That means freshness is a key factor as far as the products and customer satisfaction are concerned. This coffee is one of best seling decaf coffee on Amazon. Tim Horton’s is very good! Just one cup of illy espresso is phenomenal as it has a string sumptuous taste that makes you want more and more of it. The Italian coffee does recognize the importance of quality, and it is therefore made to cause satisfaction and a genuine thirst for more of it at the same time. Maybe a bit pricey but this coffee is worth every penny. This amazing decaf coffee cannot be achieved unless it is kept at 100% pure Arabica coffee. What is more, it is a blend of more than eight types of original and high-quality Arabica coffee; an explanation behind its great taste. This king of all beverages is made from a wide variety of coffee from different parts of the world. and all Gevalia coffees are very good. 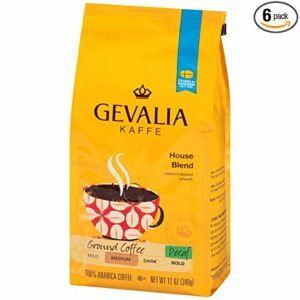 Gevalia Decaf House Blend has a cool taste which is not bitter but brings a high level of satisfaction and refreshment to the coffee lover. It is roasted delicately so that its original flavour is not lost but kept at a certain level for the sake of amazing experience. GEVALIA does not have almost any caffeine inside it; neither does it have chemicals that have any effects on the body of coffee lovers. Gevalia Decaf is wonderful coffee! 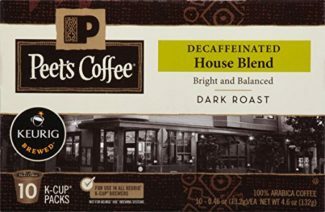 As in other categories and in category of the best decaf K cups is Peet’s Decaf K-Cup coffee, House Blend. It is hard to find good dark roast decaf full bodied k cups. If you still looking you must try Peets k-cups. They decaffeinated coffee naturally with Swiss water process. Roasting and processing is done by experts. 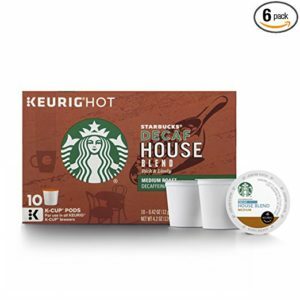 This K-cups work with Keurig 2.0. Peets is known for its fine distinctive coffee since it started its operation more than fifty years ago. The roasting is the only process that is utilized to ensure that there is the right flavor for the product. Its great quality does not rely on any foreign chemicals. This coffee is 100% Arabica coffee and is made for Keurig Brewers. Being an original product, Dunkin’ is kosher qualified and can be taken by anyone in the society without fear of health deterioration. It has an incredible flavor which is believed to come from the roasting process by the experts at the plant. 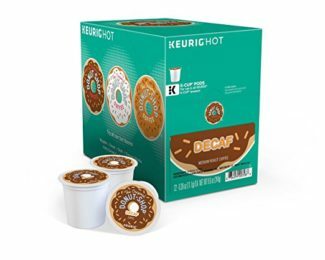 Only cons is that this kcups can be more eco friendly. It is smooth and highly flavored. 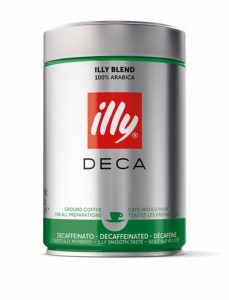 One of the best de-caff brand on market. You can’t beat Dunkin’ Donuts coffee. I recommend it highly. Fantastic taste. Most coffees are normally known to be too harsh and at times very bitter. The original Donut shop coffee is neither too harsh nor too bitter. It is just an accurate balance of the two. While other manufacturers are struggling to do away with the bitterness, this one recognizes the thirst for a little bitter coffee for the ones who value that kind of taste. It is a medium roast decaffeinated coffee which is carefully processed with the aim of ensuring that the originality is not expunged from it. 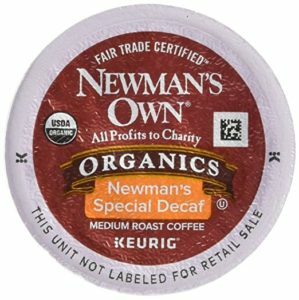 Newman has something unique for you; the coffee lover. With a maximum of 24 k-cups, Newman brings to you a coffee that has a bold, yet refined taste that is meant to bring that satisfying moment in a uniquely elevated manner. While the chemical content reads zero, this one has an amazing smoothness that cannot be matched by other brands. The k-cups are efficient for a one cup brewer as they are designed to contain the right amount of coffee. The products are available both online and offline, and the orders are easy to place as they are delivered on a door-to-door basis if that is what the buyer wants. This coffee tastes so sweet with some fruity smell, and it is again so balanced regarding blending. It is a medium roast coffee which has no caffeine content and is, therefore, Kosher certified. It comes with six cartons, and each cartoon has 12 k-cups packed inside. When we try first time we did not expect too good coffee. However, again Eight O’Clock is very positively surprised for us. 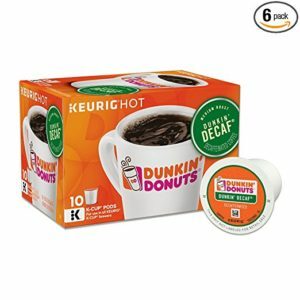 If you are still looking for a perfect decaf k-cups maybe your quest here ends. This coffee has a unique taste that comes from some ripe fruits which are incorporated during the processing. It, however, does not have chemicals as it’s deeply decaffeinated by the experts. Through dark roasting, the final product is ensured to have the typical taste of the natural coffee with some spots of ripe fruity taste in it. With this coffee will feel exceptional pleasant and full flavor. It comes with a maximum of 96 k-cups packed in the carton. Be sure to place your order on the right platform to avoid fake ones. This coffee is pretty much top in it’s class. 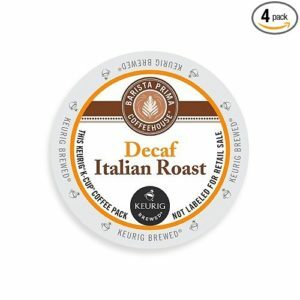 This is one of our FAVORITE MEDIUM ROAST DECAF K CUPS. 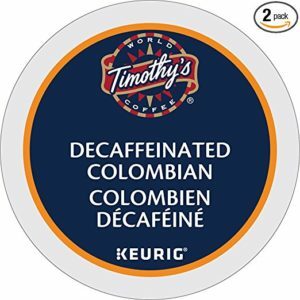 Timothy respects that idea that there are many people who are in love with the decaf. It, therefore, ensures that the products supplied to the market have zero caffeine content. It is delicious for the individuals who are trying to minimize the level of chemical consumption into their systems. It is one product that is compatible with all Keurig Brewers, including the 2.0 brewers. The brewing takes place inside the cup to ensure no residue left behind to sabotage the next cup. This is going to be the most amazing decaf coffee you shall have tasted so far. It has a smooth texture which makes it an enjoyable beverage. In addition to being smooth, it is made with a natural flavour that comes straight from nature itself. You do not have to worry about chemicals as it is a decaffeinated coffee that is just meant to bring that natural sweetness as soon as it gets onto your tongue. If you are looking for best decaf instant coffee, then you are at the right place. Check out our top list of best decaffeinated instant coffee that you can always carry with you and easily make with a little hot water. Arabica coffee beans are the best ingredients to come up with a high-quality coffee, and that is all about the Mount Hagen Organic Instant Decaffeinated Coffee. They are packed in individual packets hence a machine is not necessary. For the sake of easy storage, the top of the carton is made with a pop-top re-closable lid. This product is therefore convenient for small families and people who are travelling and might need coffee in the process. The company has just redefined its product packaging, but quality remains constant. This time around, there is just going to be more saving for you as the beloved customer. It has the same characteristics, but there is not going to be a single content of caffeine in the product. The two raw materials are the 100% Colombian coffee and 100% Arabica coffee. There are no additional ingredients to boost the taste of the product hence; it is natural and ideal for a typical coffee lover. This is the most interesting coffee product you will ever find in the market. With only 7 ounces of it, one can yield 90-120 cups of coffee. It is a fine blend of both Robusta and Arabica coffee. There is no need for caffeine for one to feel like they are taking coffee, hence; this product does not have caffeine inside it. It is carefully processed with the coffee lovers being cared for. This one is quite straightforward in terms of the product description. What you need to know as a coffee lover is that it is decaffeinated and therefore it is healthy and can be taken at any time of the day. The flavour that it has is natural and does not get compromised by an external chemical. This product is available at any time as one can easily place an order and wait for the product to be delivered to their doorstep. Many prepare Spanish latte with Café Bustelo Instant Coffee but we prefer to make Spanish latte with espresso shots. Douwe Egbert pure Decaf instant coffee is always ready to use for it brews after very few minutes. The product is of high quality as the coffee used is procured right from where they are grown under the right weather conditions. Anyone looking to add a phenomenal coffee experience to their beverage life is more than welcome to try this amazing high flavoured coffee product. This one as well can be bought by placing both online and offline orders with the right dealers. This is one of the best decaffeinated coffee products of all times. When it comes to time-saving, Kenco smooth is the way to go. It has an amazing texture and gets brewed within ten minutes. This one is the ideal product for the people who believe in time being money. It is original and does not contain foreign chemicals to achieve high quality. The expert blenders do their work while taking care of the clients’ needs. This coffee is a blend of both Arabica and Robusta coffee. The fact that it is naturally caffeinated implies that it does not have harmful chemicals included in the package. It is vital to note that though there is blend of two varieties of coffee, the product is 100% pure. It has the flavour that matches quality required by most of the clients who know the taste of a typical product from the best dealers. Starbucks is that coffee product that is solely made using the Arabica coffee beans without the addition of any foreign contents. The roasting and processing are done by professionals to ensure that the final product is of the right quality and taste. Since it brews within ten seconds, it is reported to be the most convenient and reliable products to clients who are looking to save on time. There is no need for coffee machine or grinders since it just brews on its own as long as hot water is supplied. Enjoy a cup of coffee that will not interfere with the central nervous system as it has zero caffeine rating. With one smallest package, one can get to brew at least 108 cups of coffee. It is natural, and its great taste comes directly from nature. The Tastle coffee will never disappoint you regarding taste, texture and the price is easily affordable. This is one product that will make you yearn for more for the more you drink it, the better it gets. The Maxwell House coffee is ideal for family use. It does blend so fast and is soft and tasty. It does come with some unique package that is just amazingly beautiful to the eye. The clients who use this product are never disappointed regarding price and affordability. The low caffeine in the product makes it highly recommendable to people who are just looking for a great beverage and nothing else. Many of you may not even know but besides instant coffee there is instant espresso. This list provides you with the best instant decaf espresso. With Café Bustelo, there is no need for the brewing. The product is always ready for consumption. All you got to do is add some warm water and stir for about ten seconds. It does contain a small amount of caffeine, but the level is negligible. With a pack of four, one can get 3.5 ounces of jars. This product is quite ideal for a family where almost all members are looking for a decaffeinated product. Looking for an elevated taste and quality? Then this is the right product for you. Medaglia does have an unusual originality that comes from the double roasting process that it is always subjected to. The dealers always have clients in mind, and so, they know their specifications that they meet professionally. It is very easy to make as it does not require a long process of brewing. Bustelo stands tall as compared to other products on the market due to the great and smooth states that come from nature itself. It is 100 percent chemical free due to the decaffeination that is done by experts. Through the roasting process, Bustelo gains a high level of taste that makes clients develop thirst as soon as they get their tongue on the coffee for the first time. It is easily affordable and is packed in beautifully designed sachets. As far as health is concerned, people should start looking carefully what they ingest into their precious bodies. Top manufacturers are found in some parts of the world and are committed to ensuring that consumers are served with the best products regarding coffee products. Coffee is a beverage that has won the hearts of many consumers in almost all parts of the world. To a certain extent, there are facts about coffee that are constantly overlooked by these consumers. It is imperative to note that while the rate coffee consumption increases exponentially, there are significant effects that it inflicts on the body of its lovers. There are several different ways to decaffeinate coffee, manufacturers usually use water, chemicals or carbon dioxide to remove caffeine from coffee beans. The quality of coffee bean and method can affect the amount of caffeine that is left. Studies show that it is impossible to find a completely decaffeinated coffee product. Nowadays, manufacturers produce decaf coffee products as the demand for this type of product increase every year. There are five methods to decaffeinate coffee and each one of them have some things that are similar or same. Every decaffeination is done with water.they rarely use only water because it can wash-out other chemicals that are important for a taste like sugar and proteins. It is necessary to use some agents like methylene chloride, ethyl acetate or CO2. Coffee is always decaffeinated before roasting, in its raw ( green ) state. It is really difficult to separate and remove only caffeine without interfering with other 1000 chemicals which affect the taste of coffee. This method is not in use anymore, but it was the first method of decaffeination used in coffee production. This method was invented by Ludwig Roselius in 1903. The method included steaming coffee beans with water and salt, and the solvent was benzene. This method is forbidden now because the benzene has a carcinogen effect on human body. This method includes two concepts, solubility, and osmosis. This method is considered as the best one because it can remove up to 99 % of the caffeine from coffee bean. We will try to keep this explanation simple so here we go. The caffeine extraction mechanism in this method is the so-called GCE or Green Coffee Extract. GCE contains the water-soluble solids components of green coffee except for the caffeine. The gradient pressure causes that the caffeine molecules from the green coffee migrate to GCE. When GCE become rich in caffeine molecules it is percolated with carbon absorbers which separate only caffeine molecules from GCE. When GCE again become caffeine lean the process is repeated in order to remove other caffeine molecules from green coffee. In this method, the coffee beans are steamed in order to make them open their pores. After that, these coffee beans are repeatedly rinsed with dichloromethane or ethyl acetate. This whole process lasts about 10 hours. In this method, coffee beans are soaked in boiling water for several hours which removes not only caffeine but also other chemicals important for coffee taste. Then the beans are washed with methylene chloride or ethyl acetate for 10 hours. The caffeine molecules are bond to chemical solvent. After that, the beans are reintroduced to the coffee oils and flavor elements in order to regain everything that is necessary for good coffee taste. This is a new method invented by Kurt Zosel. In this method, CO2 is used as a chemical solvent. When using this method the coffee is soaked in water in the stainless steel barrel, then the CO2 in a liquid state is forced into it with high pressure. The CO2 only separate the molecules of caffeine. This is a method that is often used in commercial production. Are decaf coffee really caffeine free? When you say decaf coffee it is never 100 % free of caffeine. In a small percentage, it is still there. After removing caffeine from coffee beans the taste should stay the same. The coffee may be a little milder in its taste but the effect and satisfaction are there, also its nutritional value doesn’t change. If you are sensitive to coffee but still want to start a day with it, you should choose some of before mentioned decaf coffee products, but you will have to reduce the amount of coffee. The effect could be the same if you drink a lot of decaf coffee. The latest studies tell us that there are many good sides to consuming decaf coffee, in the way that it can prevent many types of heart, liver and brain damage. If you a real coffee lover and you can not give up of this marvelous drink but it has some bad influence on your body, you should choose some of these products and continue with your favorite morning routine.